Does it warn you about what to do if a shark comes up out of the loo while you are sitting on it? Yes it does. And how to find out if your granny is a robot? That too. And what to do if a volcano erupts underneath your house? This book deals with these questions. 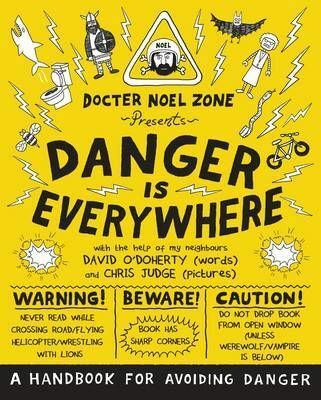 Diary of a Wimpy Kid meets The Dangerous Book for Boys, Danger is Everywhere is a brilliantly funny handbook for avoiding danger of all kinds that will have everyone from reluctant readers to bookworms laughing out loud (very safely) from start to finish. Does it warn you about what to do if a shark comes up out of the loo while you are sitting on it? Yes it does. And how to find out if your granny is a robot? That too. And what to do if a volcano erupts underneath your house? After you've made sure it's not a neighbour's barbecue, this book will let you know exactly how to deal with it. "I dislocated my jaw laughing". (Eoin Colfer, author of Artemis Fowl). Written by Docter Noel Zone, the world's greatest (and only) Dangerologist, with the help of his neighbours: David O'Doherty (words): a multi-award-winning stand-up comedian, writer and popular guest on television shows such as QI, Have I Got News For You and Would I Lie to You? David has written two theatre shows for children, including one where he fixed their bicycles live on stage. Chris Judge (pictures): the award winning author/illustrator of The Lonely Beast, three successive picture books and a number of other projects.Chris' work has appeared in high-profile advertising campaigns, newspapers, magazines, exhibitions and other media in Ireland and the UK.